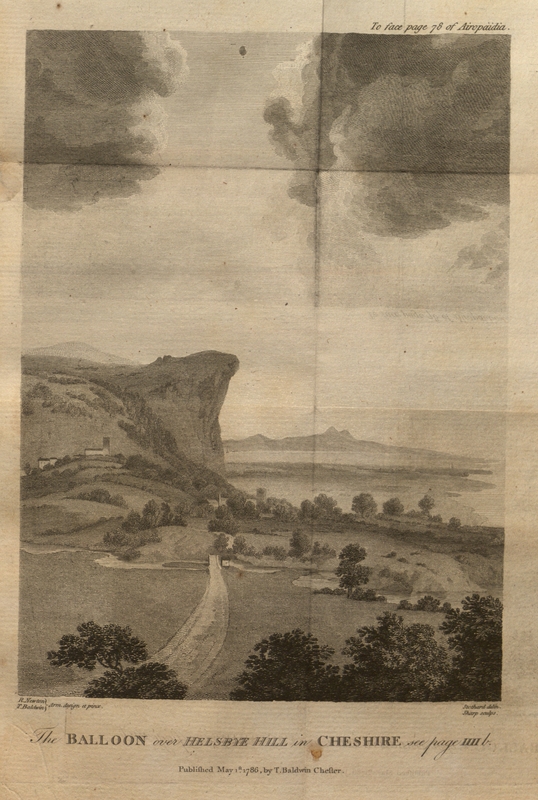 “The balloon over Helsbye-Hill in Chester, at half past II on Thursday the 8th of September, 1785. It is seen in the southwest quarter. The view was taken in a high field, at the end of Sutton-Causeway. Helsbye-Hill, tho’ upwards of 600 feet high, appeared from the car of the balloon, to be on the same level with the grounds below” (T. Baldwin, Airopaidia to face page 78). This image uses a simple gray scale and minimal contrast to give as realistic a look of the landscape as possible. It simply looks like a view from the balloon. It differs from the previous image in this gallery in that it does not offer representations or a mapped out, symmetrical look at the land from above. It shows a view of a hillside, lined with buildings, trees, and other greenery. A little dirt road can be seen, and the clear sky is dotted with big, fluffy clouds.